One of the most iconic castles in Switzerland. Most likely the most photographed castle of Switzerland and only a little less famous than the Matterhorn. It looks and feels like a real castle, rising out of lake Geneva in a most dominant way. The castle is more stone and walls and has a very medieval feel to it. It's not as beautiful as many other castles, but it strategic position and grand view of the alps makes it one of the biggest castle attractions of the country. If you are ready to pay the admission fees (CHF 12.– adults) to enter the castle I'm sure it's worth the visit. The garden just outside the castle is also very nice and has a very beautiful view of the castle walls and all it's towers. There's also a little restaurant that serves drinks and snacks for travelers that just want to enjoy the view. You can also walk from Montreux along the lake and enjoy the view as you approach weather permitting. Chillon began as a Roman outpost, guarding the strategic road through the Alpine passes. The later history of Chillon was influenced by three major periods: the Savoy Period, the Bernese Period, and the Vaudois Period. The oldest parts of the castle have not been definitively dated, but the first written record of the castle is in 1005. 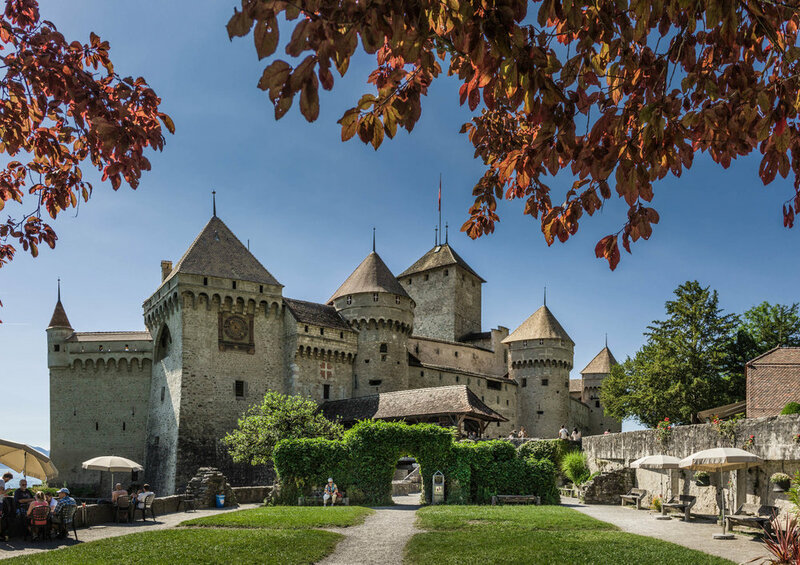 It was built to control the road from Burgundy to the Great Saint Bernard Pass from the mid 12th century, the castle was summer home to the Counts of Savoy, who kept a fleet of ships on Lake Geneva. The castle was greatly expanded in 1248 by Peter II. except Jan. 1st and Dec. 25th.